Posted by Jon in Hasbro, News, Star Wars with 2 comments. Interested in unveiling a new Star Wars Black item for the first time? Well now is your chance as the Hasbro Pulse Instagram account has announced a Fan Unboxing Contest! 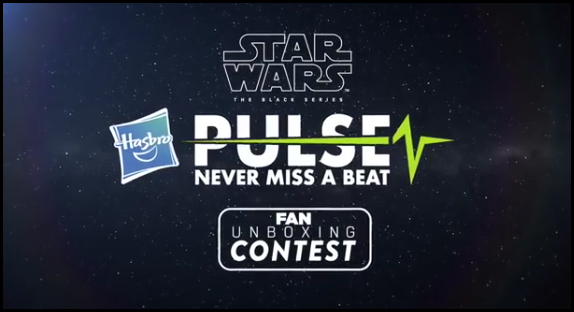 Go ahead and check out the official video explaining the contest over at Hasbro Pulse’s Instagram page. Basically they want you to make a creative unboxing video or review of a Hasbro Star Wars Black Series product that is no more than sixty seconds. You will need to post the video to your Instagram account and use the hashtag: #Hasbroblackseriesunboxingcontest. The winner chosen will get to travel to Hasbro’s headquarters in Rhode Island and reveal a brand new Black Series collection figure. Check out the official rules of the contest here. The submission deadline is at 11:59pm EST on Wednesday April 18, 2018. Even if you aren’t going to submit a video to the contest, keep your eyes peeled as the winner will be revealing this new figure on May 25, 2018. Coincidentally it is the same day that ‘Solo: A Star Wars Story‘ hits theaters. Good luck all! I wonder if the “brand new Black Series collection figure” will be the Imperial “Mudtrooper” from the Solo movie, who seems to be conspicuous by his absence as far as Hasbro toys are concerned (they’ve got figures of the other three new troop types from the film in multiple scales, but so far only Jakks and Funko have revealed Mudtrooper toys). I was thinking by the size of the box in the video it may be the Enfys Nest with Swoop Bike that a bunch of stores took preorders for and then pulled.